San Diego, CA, March 15th, IDW Games and VIZ Media announce Death Note: Confrontation. This 2-player game challenges players to a head-to-head battle of the wits. Based on VIZ Media’s popular anime series and recently adapted into a Netflix live action film, Death Note follows Light Yagami, an ace student with great prospects bored out of his mind. But all that changes when he finds the Death Note, a notebook dropped by Ryuk, a rouge Shinigami death god. Any human whose name is written in the notebook dies, and now Light has vowed to use the power of the Death Note to rid the world of evil. But when criminals begin dropping dead, the authorities send the legendary detective L to track down the killer. With L hot on his heels, will Light lose sight of his noble goal… or his life? In Death Note: Confrontation, players take on the role of either L, as he tries to deduce Kira’s true identity, or as Light, as he delivers justice to as the supernatural killer Kira. Each player uses their character’s specific notebook and either as L, reveals the criminal targets and to systematically locate Kira, or as Kira, eliminates targets in order to gain enough victory points. Death Note: Confrontation, designed by Jordan and Mandy Goddard (Lotus), places players in the hot seat as they battle wits to out-smart the other player. 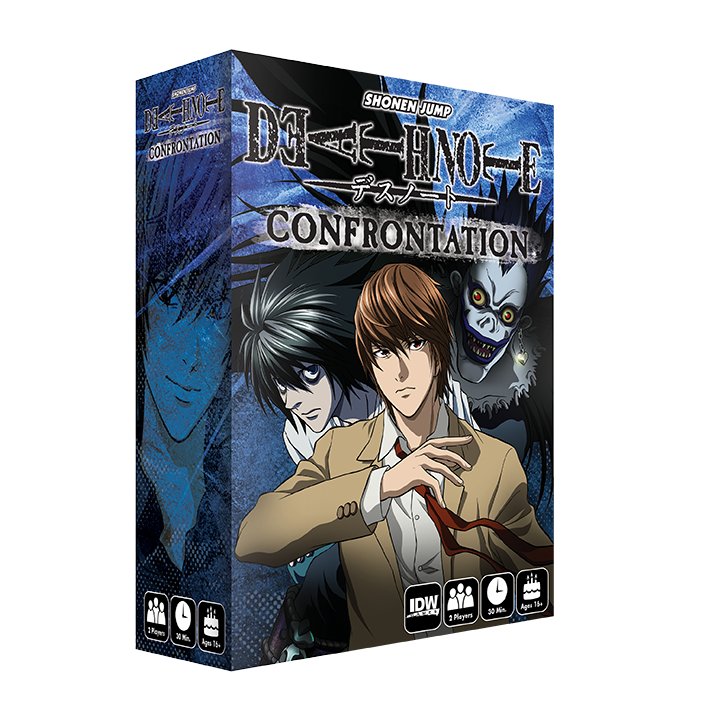 Death Note: Confrontation will be releasing to retail in June 2018 for $29.99. For more information follow the IDW Games social media and website about this upcoming head-to-head game. The agreement was brokered by Evolution USA, the licensing agent for VIZ Media in North America. ← We’ve Funded! Thank You For All The Support!